The Lightning are Cup favourites, and there's no player more important to his team this season than Kucherov. According to Hockey Reference analytics on goals created and shares of standings points, Kucherov leads the league in both categories — just ahead of Edmonton's Connor McDavid, who's widely considered the best player in the world. And this isn't out of the blue after Kucherov put up 85 points in 2016-17 and 100 points last season. Agent Dan Milstein chalks up this growth to experience and Kucherov's willingness to look around the NHL for ways to improve. "He's a student of the game, so he's constantly watching others, learning from others," Milstein said. "He's very much in the know of what's happening around the league and what's happening around the hockey world. He works. Every free moment he has he spends improving his own skills." Current and former teammates respect Kucherov even more because they see that work up close before and after practice. "Sometimes if a guy puts up 100 points the year before, maybe he might sit back on it," said Chicago Blackhawks defenceman Slater Koekkoek, who played parts of five seasons with Kucherov. "But Kuch is always like the first on the ice, last one off. He's always working on it." The work that went into making Kucherov the NHL's leading scorer also made him attractive to Adidas, which signed him last month to a multiyear marketing contract. 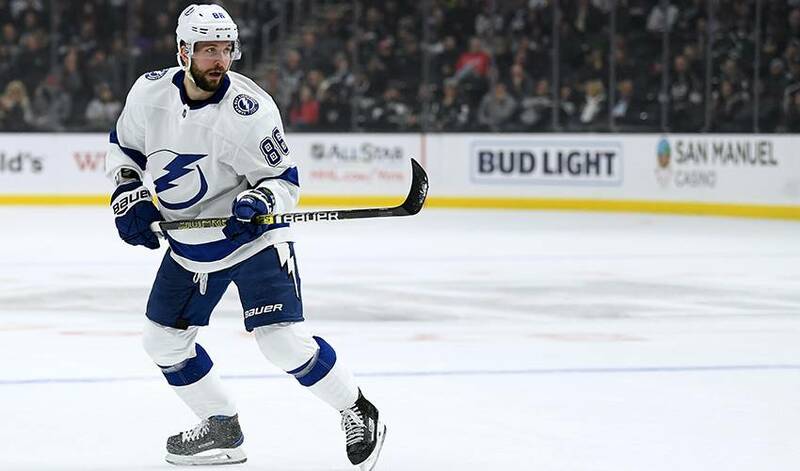 After Kucherov signed a $76 million, eight-year extension last summer, it's impossible to say he's underappreciated for his contributions, but the Adidas deal pushes him into another level of stardom — even if reluctantly. "He's a creator in all sense of the word," Adidas senior director Dan Near said. "He's somebody that does the unexpected, that has his own personality, albeit humble. That's not a problem, right? Being modest and humble are an amazing character trait of hockey players. But his game on ice is filled with this confidence and swagger that I think is remarkable, actually, when you look at it for a guy his age who has had to adapt to American culture." Kucherov is only 25, but he left his home country to adapt to North American hockey at the junior level in 2012 and chooses to spend most of the off-season in Florida. He has come back each season with a new tool in his toolbox of skills, from a better one-timer to even more precise passing. Growing up, Kucherov wasn't a prodigy and has spent much of his time proving doubters wrong. A second-round pick of the Lightning in 2011, Kucherov is conscious of the fact he has had to earn everything and build his game block by block. His mentality remains the same. "Nothing came out as a kid like this," Kucherov said. "When I was a kid, I was always playing for my teammates and I liked to play give-and-gos because it's a team sport. You can't be selfish in here, and you have to use your teammates. It's a tough league here to do it by yourself." Kucherov certainly doesn't do it himself; he plays with 90-plus-point producers Steven Stamkos and Brayden Point on the league's highest-scoring team. But this season he has emerged as otherworldly in his play and his numbers, and he deserves some credit for teammates' statistical improvements. "He's just an elite player," said Minnesota Wild forward J.T. Brown, who played four and a half seasons with Kucherov. "His vision is there. He's always looking. Sometimes you think it almost gets overlooked because he is such a dynamic scorer and he can shoot from anywhere and score, but he's just as good at making players around him better and setting them up and putting them in good positions." Kucherov's unselfish play sometimes leads coach Jon Cooper to want him to shoot more, even if it's against his instincts. Given how good his shot is, teammates would be fine with Kucherov firing away, but they also know how much better the Lightning are because he's pass-first by nature. "He can find guys and put the puck on guys' tape through (opponents) where there's not a lot of guys that can do that," Tampa Bay defenceman Ryan McDonagh said. "He understands that's a strength of his game, and he tries to give ourselves as many opportunities to create scoring chances as he can." Teammate Braydon Coburn raves about Kucherov's vision. Adam Erne talks about Kucherov's ability to make plays out of any situation. And while Near expects Kucherov to one day take the torch from Alex Ovechkin and Evgeni Malkin as the best Russian player in the league, those close to him never hear him talk about the many goals or assists he's piling up. "On a night when he scores but the team loses, it's not a good night," Milstein said. "Instead of putting up lots of points for yourself, this is about winning the games and the ultimate goal is winning the Stanley Cup. This is the only thing that's at stake in his professional career." Even before Nikita Kucherov became the hottest goal scorer on the planet the Muscovite made quite an impression on Detroit Red Wings newcomer Luke Witkowski.